This Cute Teddy Bear Diaper Cake is huge! 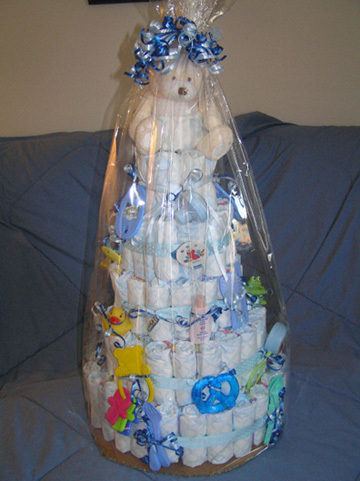 This Teddy Bear Diaper Cake is the largest diaper cake I have ever seen! It has 5 tiers! This adorable baby diaper cake was made and submitted by Elena. Her instructions and ingredients are below so you can see how she created this masterpiece. Thank you Elena for sharing your beautiful diaper cake with all of us! This cake was made for my daughters 3rd grade teacher. 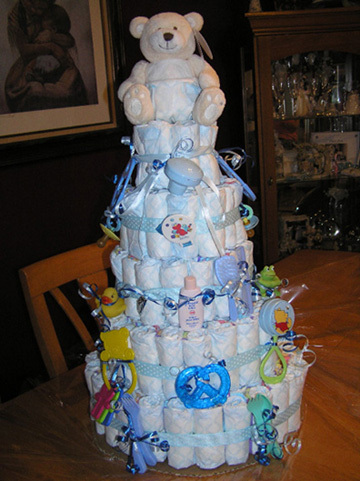 This Cake is made of about 170 Size 1 diapers. It has 4 Tiers held together with an empty wraping paper roll. Ribbons were tied around to cover the rubberbands. Baby items such as teething rings, rattles, nail clipper, medicine dropper, fork & spoons, comb & brush etc were attached with curling ribbon. A teddy bear was used as a cake topper then it was wrapped with clear wrap & more curling ribbon and a platter was cut out of the box from the diapers. Thank you for the wonderful directions to make this cake it came out great couldn't have done it without the help of this website!! Thanks Elena! It is an extraordinary diaper cake! !